What helped you connect to the story of bees and trees? My parents are commercial salmon fishermen, and I have spent a few months out of every year working along side of them in Haida Gwaii and now southeast Alaska. I think that this part of my life really informed how I thought about and approached communicating these projects in the sense that I was able to put myself in the shoes of the resource stakeholders. It also didn’t hurt that I find the use of genomics in commercial beekeeping and forestry applications fascinating in general. I think that we are going to start seeing some very interesting results of genomic research; things we could never dream of before. What is your background in film-making? I have been an avid still photographer since the age of 15 and began making short experimental films when I was 17. Some people naturally pick up a paintbrush, and I gravitated toward cameras and the study of light. 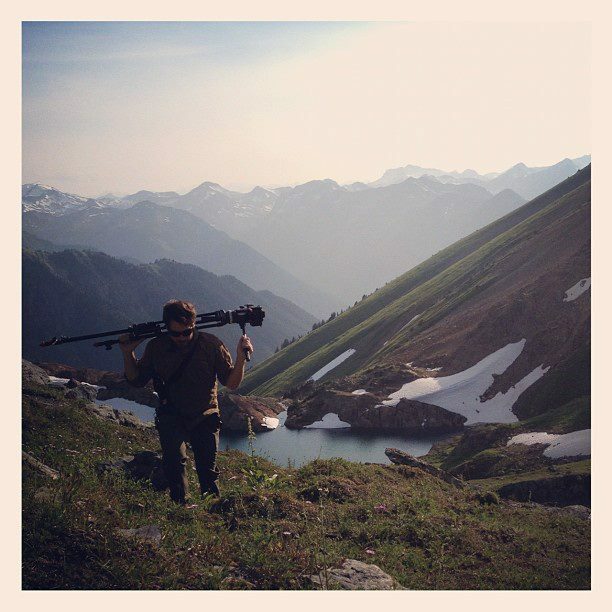 Instead of going directly to university when I graduated from high school, I decided to take a job as a full-time videographer for a production company that makes snowboarding films. This was a great experience because I was able to travel all over North America, and learned a lot about the difficulties of filming in remote locations and extreme conditions. When I finally made it to UBC, I wanted to utilize my fisheries background and further develop skills in resource conservation. Through the Faculty of Land and Food Systems “Global Resource” program, I started focusing on fisheries ecology and food policy. However, based on my photographic portfolio, I was also accepted into film courses and really connected with some of the professors. I think my biggest influence there was the award-winning documentary director Nettie Wild, who taught by example that art truly can be a catalyst for positive change in society. I think another really important component of my education was the anthropology work I was able to conduct with another one of my mentors, Charles Menzies. We designed a directed-studies course where I researched and performed a visual ethnography of Commercial Fishermen in southeast Alaska. I learned so much about building relationships with my collaborators, the ethics of visual representation, and the use of video as a tool. It felt really good to bring these skills to my work in the internship. In my process, I tried to understand what exactly the research was all about and translate this to a story format. I had to do a lot of reading during my pre-production time to wrap my head around what exactly was going on in the research, identify the important ideas, who the audience was, etc. I realized the importance of taking a step back to see how the research is traditionally presented, and think about how different people will understand and view it, which enables us all to have a conversation. However, once you go out into the field, you kind of have to set down that outline you’ve made in your head and let the reality of the situations guide the content. I try really hard to stay true to the intentions of my collaborators: both the researchers and stakeholders. While I think it’s impossible to be completely unbiased in the production of anything, I did my best to convey the researchers’ ideas and desires for their project without imposing my views, or those of Genome BC and UILO. To create the AdapTree video specifically, I did an interview with Sally Aitken and then began seeking images of forests based on this content. This led me to the alpine areas in the Pemberton backcountry to obtain footage of stressed trees, as well as many logging roads in the Princeton area to see lodgepole pine stands that were hit really hard by the mountain pine beetle. I then spent a week in Grand Forks with the research team to get footage of them working with a husband-and-wife team who are commercial bee breeders. This style of shooting was a bit different in terms of shooting the action first and then asking questions afterwards. I think that the polarity of these situations is a good example of the way you have to adapt to the reality of a given situation and letting that guide the content. I had a lot of preconceived ideas of the research projects as I was doing my own research in pre-production. However, these perceptions quickly changed when I went into the field. In a way, the final product is the outcome of what I had previously thought and what I learned through the process, which is to be open to letting the information and experience take you in a different direction. The AdapTree project taught me that imperfect climate models we have currently are the really hard part about communicating research like this one. When knowledge is evolving and partial, it makes it challenging for researchers to communicate with their stakeholders. This limitation can serve to isolate researchers, as the general public doesn’t understand or, in some cases, doesn’t trust the science. As a result, my video attempted to tell the story from the view of the people engaged with the project. I also learned a lot about bee breeding and beekeeping in general. Liz Huxter (Bee Breeder, BC Bee Breeders Association) is so invested in her research and her passion for bees came through so strongly, it allows people to connect to the project. By talking with her, it became very clear why the breeding process is so challenging and how genomic tools can assist beekeepers in reducing the risks of colony collapse. I began to see that the losses were less ambiguous than I had previously thought, and are largely due to increasing amounts of chemical use due to resistance, which Terry Huxter explains in his interview. Any highlights that you’d like to share? My highlights were getting to learn more about this exciting research and the people behind it, especially my time in Grand Forks with the research team, who were all such wonderful people. We were working such long days that it wasn’t until about 10PM that we’d all sit down for dinner and really get to know each other. Another highlight was searching out the forest locations. During one of these trips, I encountered the largest grizzly bear I have ever seen! Fortunately, it was much more skittish than I was and I ended up setting up camp only about 100 feet away from that encounter! You can view some of Steven’s videos below.